The doctors at Affiliates in Podiatry are all Diplomates of or board certified with the American Board of Podiatric Surgery. They all have multi-year residency training in the latest foot and ankle medical and surgical techniques. Our doctors are committed to continuing medical education, allowing them to continue to provide you with the finest possible specialty service. We constantly strive to provide our patients with good outcomes in an efficient manner. 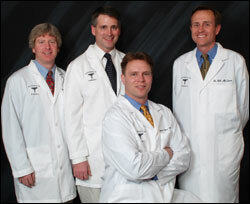 From left to right: Dr. Davis, Dr Detwiller, Dr. Biss and Dr. McCann. The staff at Affiliates in Podiatry are highly trained professionals with experience in both your medical needs and customer service. We pride ourselves as a well structured team that works together with the goal of providing you, our patient, with the highest quality foot and ankle care possible. The compassion of our staff is evident as you receive comprehensive foot and ankle care in a dignified, comfortable setting.